I believe It truly is that simple. I know there are people who feel it is their “station” in life that makes them better than others and more deserving of things. That by birth (or belief) they’re entitled to certain rights and privileges that others are not. That their way is the right way, etc…… I just don’t agree. I guess I am lucky to have been born American and that is why I stay here, I want the freedom to believe this even if you don’t. I believe whatever I’m entitled to in life, I can’t judge another to be less entitled, less deserving of the same things. I guess that is why I love this quote. 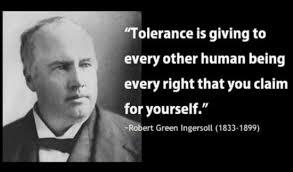 The word tolerance is a good word yet I feel it being turned around. Every day I feel the word is becoming something akin to racist or bigot. Maybe it is just me…maybe I am overly sensitive, but I feel I hear this word being used by some people to describe a person who is less than desirable, someone who is slipping away from their faith and from God. Again it may be me or may be a religion thing….I don’t know. What I do know is I love diversity. I love a good (friendly) debate. I love exploring different faiths and the people who are a part of them: and those who have no faith; at least in a deity. I love different people..cultures, thoughts, beliefs. I spoke to a good friend this morning, he and I have different beliefs, yet we have great conversations and I consider him a good friend and a wise man. I love that we can speak on these subjects and we have tolerance and beyond that…we have a friendship forged out of a common interest and love for humanity. I encourage him and he encourages me. And we both have a hope for humanity and this hope, whether it is faith-based or man-based, is a hope none the less and it encourages me! I can ask for no more than to be encouraged in life. I want to wake up each morning knowing there is hope! And I am blessed to see it daily. I want to believe where there is love there is hope, I will continue to write each day about this love and this hope. I feel things in life, things that I can’t see, the thing I feel most is love!! And that gives way to hope. Naive? Maybe so…..I am OK with that!! The pure joy I feel when I wake up is because of this feeling, this knowing, God has breathed into my soul this….thing. And I honor it and Him. I always will. So naïve it is! !